Which of the following is indicated in this patient? B is correct. This gentleman presented with a classic story for pulmonary embolus (which was later confirmed via CTPA). 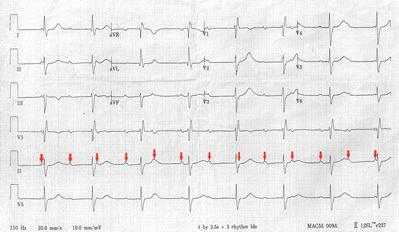 However, he is also significantly bradycardic (his ECG rate was 45 bpm), especially in light of his pulmonary embolus. Further examination of his ECG demonstrated complete dissociation of the atrial and ventricular beats (note the regularly spaced P to P intervals highlighted by red arrows in the picture below). Additional findings on this ECG include a right bundle branch block (QRS >120 msec, RSR in lead V1, and wide S wave in leads V5/V6) and a left anterior fascicular block (left axis deviation, small Q wave in lead I, large S wave in lead III, and an associated RBBB). Third degree AV block (also known as complete heart block) is a medical condition in which the atrial impulse is unable to traverse AV node, forcing the ventricles to create their own rhythm, known as an “escape beat.” There are a variety of causes with the three most common being myocardial infarction, congenital lupus and Lyme disease. 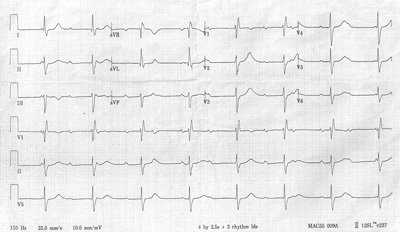 Patients may be discovered on an incidental ECG (as in this patient) or as a result of symptomatic bradycardia or hypotension. Because of the risk of severe bradycardia and dysrhythmias, most patients eventually require pacing. Mobitz Type 2 AV block is also an indication for pacemaker placement given its propensity to progress into complete AV block. This case highlights the importance of always examining any additional tests or labs ordered, as it is easy to overlook other important findings after the initial diagnosis is made. 1. Rosen KM, Dhingra RC, Loeb HS, et al. Chronic heart block in adults. Clinical and electrophysiological observations. Arch Intern Med. May 1973;131(5):663-72. 2. Epstein AE, Dimarco JP, Ellenbogen KA, et al. ACC/AHA/HRS 2008 guidelines for Device-Based Therapy of Cardiac Rhythm Abnormalities: executive summary. Heart Rhythm. Jun 2008;5(6):934-55. 3. Kojic EM, Hardarson T, Sigfusson N, et al. The prevalence and prognosis of third-degree atrioventricular conduction block: the Reykjavik study. J Intern Med. Jul 1999;246(1):81-6.